Gifted and Talented Visual Arts Program co-ordinator Fleur De Campi, Year 10 student Arya Becker-Knox and Year 12 student Taj Alder. 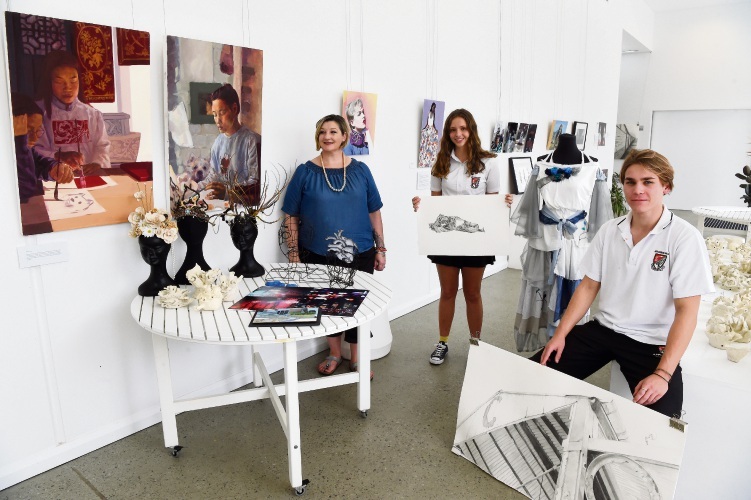 THE success of Applecross Senior High School’s gifted and talented visual arts program over the last 50 years has co-ordinator Fleur De Campi confident it will continue to produce talented creatives. The visual arts program began in 1968 and was, according to the school, the first of its kind in the state. “Our prestigious visual arts program produces graduates highly regarded by tertiary institutions and the arts industry due to our tradition of excellence and reputation for success,” Ms De Campi said. Five decades after its foundation, its triumphs are hard to deny. Among students to take advantage of the program and its band of talented tutors is digital animator Raoul Marks, who has worked on title credits for television series including True Detective and Westworld. Abdul Abdullah was the man behind a portrait of political commentator Waleed Aly, a piece nominated for an Archibald Prize in 2011. Artists including Tane Andrews and sisters Anya and Marika Brock have also made an impression after leaving the school. The success of the program had Ms De Campi confident more would follow. “It’s really validating that we’re doing the right thing, laying a foundation for their career,” Ms De Campi said. Applecross SHS will mark the 50th anniversary of its visual arts program as part of an open day on April 7. Visit the Gifted and Talented Visual Art workshops in action.